From June 11, 2018 Google increased the prices for Google Maps by 14x and severely reduced the free threshold limits with only 5 weeks notice to developers. This created a huge problem for many websites who had built services around Google Maps, including Paragliding Map. A decision was made to continue to offer free services on Paragliding Map, but that these services would have to be moved to OpenStreetMap data instead. Subscribers can continue to use Google Maps features of Paragliding Map, such as terrain view, because their subscriptions can be used to offset the charges from Google. If you are a subscriber, you will see no changes to the apps except that you now also have the option to use an OpenStreetMap map type in addition to Terrain, Street and Satellite. The need to develop a solution within 5 weeks also necessitated repurposing the app for use on the website, as I simply didn’t have time to develop and debug separate apps for Android, iOS and the website. Although this means that some features of the website are no longer free, it allowed me to bring many new features to the website which were previously only available in the apps such as the new site photos, unlimited webcams per site, chat, improved favourites and a more modern design. Another big bonus is that now a subscription on the website can be used in the app and vice-versa. If you already subscribe via iTunes or Google Play, simply go to Preferences and log in or create a new account. This account will be linked to your subscription so you can also use it on the website. Continuing to offer free services in the Paragliding Map website and apps required me to work full time on the solution for a full 5 weeks, which meant I couldn’t work as a contractor, so I hope you continue to enjoy the free services of Paragliding Map and perhaps even decide to subscribe. And if you already have, thanks! From today, all news will be released on Twitter. This will enable more people to see what's happening at Paragliding Map more easily. Click here for Paragliding Map on Twitter. (9 Dec 2016) Holfuy weather data integrated. Holfuy have kindly provided a data feed for their weather stations for Paragliding Map, so now their data is fully integrated into the website and apps. Fixed an issue in the Flyland import parser, which was causing strange characters to be displayed instead of the umlaut characters ü, ö, ä, etc. This affected roughly 500 launches and landings. Webcams data has been improved, including automatic imports of foto-webcam.eu data, support for the new Webcams.travel API to discard outdated or inactive webcams, and the iOS app now has no limit on the maximum number of webcams for each site. The images displayed in the site details on the website are sourced from Panoramio. Approximately 300,000 new images will now be displayed for sites. Version 8 of the new univeral app has been released to iOS. The new version is offered through a subscription model, rather than a one-off purchase, which will allow me to integrate new (expensive) data sources and provide better support. Totally re-written for modern iOS devices. Google Maps with terrain view are back, baby! Future flyability: Display the map as it is forecast to appear in the future. Advanced search. Search by wind direction, your location, site attributes, etc. Favourites and search results display current conditions and flyability. Windfinder forecasts now displayed in-app. New thermal hotspots map layer. See where other pilots found thermals in the past. Original data sources displayed for each site (DHV, FFVL, etc). Clicking a data source takes you to the original information. Street View. Preview the area before you visit. “Too cloudy for thermalling” is no longer marked as not flyable. Can select details for copy/paste. Built-in support for restoring purchases. As time goes by, webcams can become inactive. Also, some webcams are only active for part of the year. Where this is the case, the webcams will no longer be displayed on Paragliding Map. You will notice that the webcam markers on the map in the Android and iOS apps are already only displaying active webcams, and the next step will be to remove the inactive webcams which were automatically linked to sites. As many of you noticed, the release of iOS 9 broke the Paragliding Map app on iPhone. Although you could get it working again by switching to Satellite mode, it was pretty annoying. I'm pleased to announce that Apple have released iOS 9.2 which fixes this issue, so upgrade your device to the latest iOS version and Paragliding Map will work properly again. Paragliding Map for iOS is well overdue for an update, which I am writing at the moment. Like the Android version, it's a complete rewrite and includes all the features of the Android version I released this year, plus a few extra goodies. Of course, the new version has a modern look-and-feel. I hope to release it early next year. You should notice that markers on the map now appear 5x faster. This performance improvement will also find it's way into the iOS and Android apps the next time I release their backend services. For some time, the DHV has been working to offer a data feed of all EU paragliding sites. This data was released yesterday, and is now available on Paragliding Map! You will notice a lot more sites and detail for each sites in all EU countries. A big thanks to the DHV for allowing Paragliding Map to share this data, and especially to Karsten Kirchhoff at the DHV, who did a lot of the heavy lifting involved in preparing the data and releasing it. (01 May 2015) Android app v7 released! Completely rewritten for Android Maps v2. New marker types on map: thermal hotspots, webcams. “View on windfinder” now opens in Windfinder app (or web browser if not installed). And the link is fixed (sorry about that!). Gust strength is now displayed in “Now” tab. A link to the local club is now displayed, if available. Lots of other little things. A test version of the Android app has been released to beta testers around the world, and will be released to Google Play in the next few weeks. FFVL weather stations were being imported with UTC timestamps instead of local, meaning many popular French sites had an incorrect weather station reading. This has been fixed. Since October 2013, I have been working on Paragliding Map full time, and have released many features I wanted to develop since the start of this project. Now you can edit any site in the system. Images from Panoramio are now displayed for (almost) every site. Site details now tell you how far away the weather station is. My alerts - receive automatic emails about where to fly in your location over the next 3 days. Now that I have rolled out the big infrastructure changes, I can concentrate on some app updates. The apps will rely on these infrastructure changes, so it was important to release them first. I have finally found the time to merge all the data sources the way I originally wanted to implement it 5 years ago. Now if the DHV have the altitude and Paragliding Earth has the star rating, for example, you will see BOTH pieces of information in the site details. Previously, I resolved duplicates by simply turning off one of the sites. Now you can also view the site at the original data source. In addition, many "chaff" locations have been removed, and all importers (Paragliding Earth, FFVL, Flyland, DHV) have been rewritten. This means I can run the importers more often, resulting in up-to-date data. (20 Jul 2013) Portuguese version - thanks to José Anacleto Zenaro (Eré)! There are a lot of paragliders in Brazil, and now they have their own Brazilian-Portugues version of the website, thanks to Anacleto who did the translations. All features of Paragliding Map have been upgraded to Google Maps v3. You should notice the site is now faster, and works better on retina displays (such as the Macbook Retina). Since I released the sister KitesurfingMap.com a week ago, I have updated Paragliding Map with the new theme. As well as looking better, you will notice some of the new features from Kitesurfing Map have come over to Paragliding Map, such as the new current conditions graphic on the site details page. An example is on the right, and shows a site which takes wind directions from the NW, W & SW, with the current wind coming from NE. This new graphic makes it much easier to quickly see if a site is flyable or not, and why. (13 May 2012) Add your own webcams. You can now add your own webcams for any site. Just click the "Add Webcam" button in the webcams area. (27 Apr 2012) Flyland.ch sites imported for Switzerland. Flyland.ch have kindly allowed the importation of their entire Swiss flying site database, which is now available on the website and apps (including the free versions). Duplicate sites have been removed to prevent double-ups, so you may see some changes. (22 Apr 2012) Thermal hotspots layer added to map. Thanks to thermal.kk7.ch, thermals are now displayed on the map as a new layer. These thermals are not calculated, they are REAL thermals that were detected by analysing hundreds of thousands of logged flights. The thermal hotspot markers are displayed where the flight data shows thermals consistently appear. In addition, you will notice that you can now switch layers on and off as required. There are also a few other nice UI tweaks. (12 Mar 2012) "Favourites" feature added. The favourites feature allows you to view and manage your preferred sites on a single convenient page. The FFVL (Fédération Française de Vol Libre) have kindly allowed Paragliding Map to display their paragliding sites and weather station data. The FFVL have roughly 150 high quality weather stations on some of the most popular paragliding sites in France. These weather stations have been linked automatically on the map to calculate flyablity for all FFVL launches. (16 Jan 2012) Site details now displayed in popup window. Full site details are now displayed in the popup window where available (mostly Germany, Italy, Switzerland, Austria and France). More to come later! (16 Jan 2012) DHV sites now imported regularly. DHV (the national German hang- and paragliding club) sites are now imported regularly, including site details. The DHV have kindly made their information available via an XML feed. Sites from the DHV are mainly located in Germany, Italy, Switzerland, Austria and France. At present, the sites need to be imported manually, but the process is largely automated. If you notice anything is too out-of-date, flick me an email and I will run the importer for you. Otherwise you can wait for the next import. (26 Sep 2011) Landing areas now displayed on the map. Landing areas from Paragliding Earth are now also displayed on the map. Open the legend (on the map) for details. (10 Jul 2011) iOS app released. Paragliding Map is now available as a free iOS app from the App Store. Now you can experience Paragliding Map on your iPhone! The iOS version of Paragliding Map has some great features which are exclusive to the iOS version, such as the ability to display over 16,000 webcams directly on the map. Click here for full details about Paragliding Map for iOS. (12 Jan 2011) Android app released. Paragliding Map is now available as an Android app from the Android Marketplace. Now you can experience all the information of Paragliding Map in the palm of your hand... plus a little extra! Click here for full details about Paragliding Map for Android. (8 August 2010) French content pages translated. Thanks to Johann Gorlier, the following pages have now been translated into French. This leaves only a few small things which remain in English, allowing French users to use almost the entire site in their own language! Thanks to all the other people who have also contributed translations in the past. The entire details popup page. The Widget (embed on your site) page. A bunch of mis-spelled or mis-translated stuff. (8 August 2010) Forecasts are now in the selected language. Previously Windfinder forecasts in the site details page were in English only. French and German are now supported. (8 August 2010) Bug in wind directions fixed. For French and German users, the "acceptable wind directions" were always in English, which could lead to confusion. This has been fixed. (22 July 2010) French translations updated. (22 June 2010) Forecasts added for over 700 sites. For some reason, many sites were missing out on forecasts even though there were forecasts available. 700 of these sites should now have accurate forecasts from WindFinder, so check out your local sites again if flyability was not being calculated for you previously. (23 May 2010) Forecast widget fixed (and now actually works!). I just figured out that the "add to your site" feature of the forecast widget was always displaying the same site, which is obviously a bug. This has now been fixed - sorry about that. If you see a bug on this site, please tell me about it and I will fix it. (22 May 2010) French version now available. Apparently French people like to go paragliding (shock! ), so I have had the main features translated into French. The translator's language experience was partying in Paris for a year, so please let me know if any of the translations are incorrect. Don't forget everything is also available auf Deutsch, and of course English. (26 Apr 2010) Added "3-day flyability forecast" to site details. If my favourite paragliding site's not currently flyable, I often want to know when it will be flyable, dagnabbit! (Mostly because I'm too lazy to go elsewhere.) The new flyability forecast answers this question with the Paragliding Map happy face (see right). Oh, did I forget to mention you can add flyability forecasts to your own website? Just click "Add this to your own website" at the bottom of the forecast for details. Go crazy! (1 Apr 2010) Webcams added to 446 sites. Webcams from webcams.travel have been added to 446 paragliding sites, and can be seen in the right-hand column of the site details. Private webcams can also be displayed on Paragliding Map. If you would like a webcam hooked up, please let me know. (1 Apr 2010) Notes added to flyability statement. Some people were getting confused as to why a southerly site was flyable with a northerly in some cases (for example). The reason is because there is no wind (less than 3 kph)! I have added some notes under the "This site is flyable!" statement to explain WHY the site is marked as flyable if this might be confusing. This way pilots can decide whether they agree with the logic or not. (24 Mar 2010) Site details shown in new, more user-friendly popup dialog. I don't know about you, but when I click on a paragliding site I always found the Google default "popup bubbles" annoying. If the paragliding site was on the edge of the map it would scroll, not much information could be displayed there and if you opened the full details page and clicked "back" you would have to reload the map, etc. Now when you click on a site you will see a new "site details dialog" appear. This new dialog is a lot more user-friendly and can fit all the site details without needing to re-load the map when you close the dialog. (05 Mar 2010) iPhone/Android version now available. iPhones, Android phones and devices running Windows Mobile should now automatically redirect to the mobile version of Paragliding Map. This is a special version of Paragliding Map designed to fit on small screens. Given the wide variety of web-enabled devices on the market, please let me know how your mobile experience goes. I would especially like to know if you have problems, but would also appreciate positive feedback. (28 Feb 2010) Fixed bug with old data. Found and fixed a nasty little bug where I realised old information was being displayed under certain conditions. This resulted in old data (over a month old!) being displayed with current data. While the remainder of the site remains English, the primary "map" function and menu has been translated into German. (14 Feb 2010) Now integrated with Facebook. The new comments feature I wanted to build required logged in users, but if you're like me, you probably hate creating a different profile on every site you use. For this reason, ParaglidingMap.com uses your Facebook profile instead. If you look at the top right corner of this page, you will see there is a new "Login with Facebook" button. In order to use the new comments feature, you need to click this button to allow ParaglidingMap.com to see your Facebook account. Once you're logged in, you will see your profile picture and a welcome message. If you don't have a Facebook profile (or don't want one! ), no problem! You will still be able to read comments, but you will not be able to post new comments yourself. As time goes by however, additional Facebook integration features will be added which you will miss out on without an account. (26 Jan 2010) Over 1,000 new official sites imported. 453 sites already on ParaglidingMap.com, but with updated information. All this information is now available to view on the map. If you are flying in one of the following countries, you will find many more sites are now available, and that information for existing sites is more complete. Please note that it will take a couple of days to start generating forecasts for the new sites. If forecasts are not available by the 29th, please send me an email and I will investigate for you. (9 Jan 2010) Removed non-reporting weather stations. Only weather stations with reports less than 180 minutes (3 hours) are now displayed. This removes a lot of clutter from the map. As has always been the case, weather reports "fade out" as they get older so fresher reports are brighter and not transparent. After 180 minutes, weather reports are no longer displayed on the map at all, but will re-appear if a fresh report is received. (29 Nov 2009) ParaglidingMap.com widget released. Now you can add a widget to your own website like the one below, showing the flyable sites around the Mont Blanc region in France. Set up a flyability widget for your club or website..
A whole bunch of new feature have been released in version 2.0 of ParaglidingMap.com, mostly related to forecasts. Forecasts: where will it be flyable tomorrow? Or the next day? 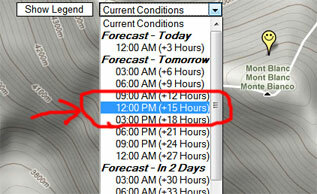 ParaglidingMap.com can now answer the question "where will it be flyable at 2pm tomorrow?". WindFinder.com is providing a special forecast feed to ParaglidingMap.com, allowing forecasts to be displayed as markers on the map. This is much more useful than the old "forecasts" tab in the site balloons, because you can now see the flyability forecasts on the map in the same way you see current conditions. 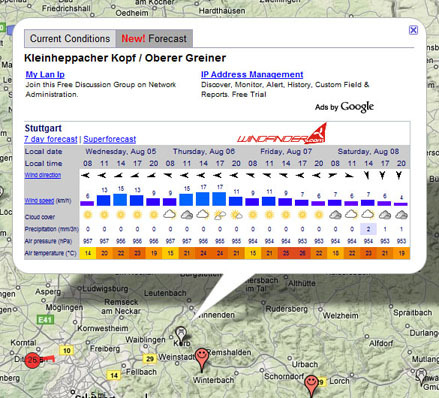 Additionally, WindFinder is producing custom forecasts for the exact latitude and longitude of each paragliding spot. This means forecasts are as accurate as possible. "Current conditions" are way more accurate. Only weather stations less than 25km away are used for each site. Previously they just used the closest one, which was sometimes too far away to be accurate. For sites that don't have a weather station, the current forecast from WindFinder is used instead. There is a new label in the site balloon displaying the data source (right next to the age of the observation), so you know whether the observation is coming from a weather station or a forecast. Many people have requested a change to the flyability icon colours displayed on the map. Most people associate red with danger, therefore non-flyable sites are now marked in red, while flyable sites are marked in yellow. In addition to the new colour scheme for site markers, two new types of site marker have been introduced. The marker indicates a site for which wind information is unknown - therefore flyability cannot be calculated. When you see one of these, please update the site and enter the missing information. The marker indicates a site that has no weather station or no forecast data. The flyability calculation has been changed to accommodate soaring sites, which can handle higher wind. If a site is a known soaring site, this is now taken into consideration. ParaglidingMap.com is now integrated right into Paragliding Earth. On the site details page, scroll down a bit and you will see a compact version of the ParaglidingMap.com map displayed inline. A lot of pilots are asking me a bunch of questions about ParaglidingMap.com, so I figured it would be a good idea to create a page explaining a few things about the site. (11 Aug 2009) Paragliding sites now imported every 24 hours. Paragliding sites are now automatically imported every 24 hours from Paragliding Earth. This means that when you create a new site on Paragliding Earth, or update an existing one, it will be available the next day on ParaglidingMap.com. Previously paragliding sites were loaded by hand, and only seldom. Don't forget, you can use the new "Update information for this site" link to go directly to the correct page on Paragliding Earth to update site information. You can find this link in the popup bubble when you click on a site. Most locations in Western Europe, the European Alps and the United States now have forecasts provided by WindFinder.com. Only paragliding sites with a forecast location within 50km are currently displaying forecast information, but soon all paragliding sites will have accurate forecasts specifically generated for their locations. Technical issues caused some outages today. These issues have been permanently resolved. Apologies for any inconvenience caused by this. (31 Jul 2009) Update paragliding site information. If information about your favourite sites is incorrect, now you can update it. Click on a site, and then click on the "update information for this site" link. Paragliding sites mashed up with live weather & forecasts. See where it's flyable right now. Worldwide! Copyright © 2009-2019 Craig Payne. All rights reserved. Get Paragliding Map for your iOS or Android device.